oil metering lines cracked while changing vacuum hoses.. I had to take my intake off to fix a leaking plenum gasket. I decided to replace the vacuum hoses since they were harder than the metal lines they hooked to.. In the process of changing the one that runs under everything and hooks to the center of the lower intake i snapped the rear rotor oil metering line right where it connects to the banjo fitting... Looks like im stuck til i can get a set from atkins. Last edited by recian; 10-06-2012 at 09:49 AM. Re: oil metering lines cracked while changing vacuum hoses..
Well I found out my intake plenum gaskets are beyond removable so i had to take my intake off so I could take them to work to put a sander to the gaskets. In the process the remaining oil metering lines broke. I also noticed my front rotor's metering line has BEEN broken and leaking on the housing.. Hopefully it didnt damage the rotor. I've put about 500 miles on the car since I bought it. So best case the front rotor has been running without the oil metering for 500 miles. (assuming the previous owner was premixing or that the intake runner's premixer was working good) When i took off the lower half of the intake i found my major source of my vacuum leak.. This would explain why i've been having idle issues and hot start problems. Not to mention most of the vacuum hoses below the intake have to be cracked off not cut. I'll take the injectors to a pressurizer and clean them out thoroughly while i've got it all apart. The screens below the injectors were full of trash so that could be an issue also. I'll clean out my 5th and 6th while i'm at it too. I checked and the actuators inside the irons move freely. Good thing you got it all looked into, small things like these affect the rotary a lot. yeah i knew my upper plenum was leaking but I didnt plan to remove the lower manifold since most replacement gaskets are metal and over $50. Turns out mine is paper and this could be what the metal ones are made to eliminate. I have a paper one coming for now since i plan to either go TII or trade the car within the next year either way. I have all the gaskets coming but I've gota wait til next weekend to order the metering hoses. Glad i found this tho. Hopefully it was my main source of the low idle, rough idle and hot start stalling. And hopefully the second oil premixer in the intake runner kept the front rotor alive since FC3Spro says that injectors and bad apexes are the only thing that can cause hot start problems. I have to wait a week or 2 til I can save up money to buy the metering lines from atkins. 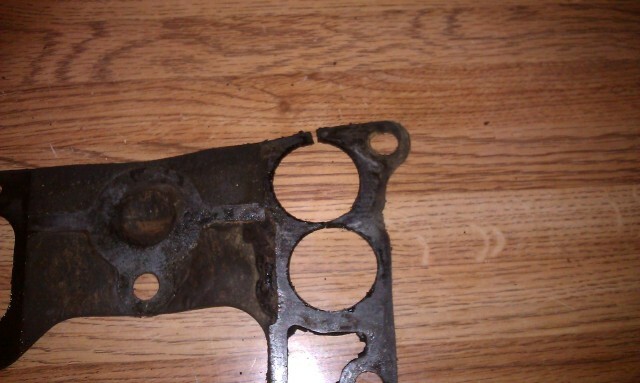 At least now I know why my engine wasnt burning any oil it's because it was starving for oil in the first place. The front rotor line that was already broken didnt leak alot of oil just a small pool so the OMP may be bad to begin with. At least with some fresh soft lines I can replace the OMP later and just premix til I do to be safe. Last edited by recian; 10-06-2012 at 04:47 PM. Quick Reply: oil metering lines cracked while changing vacuum hoses..